Note: The configuration for this aircraft in Vertipedia is still under development and may not be correct. As part of the Joint Strike Fighter (JSF) program, the Boeing X-32 concept demonstrator uses a derivative of the Pratt & Whitney F119 engine with Rolls-Royce lift components. 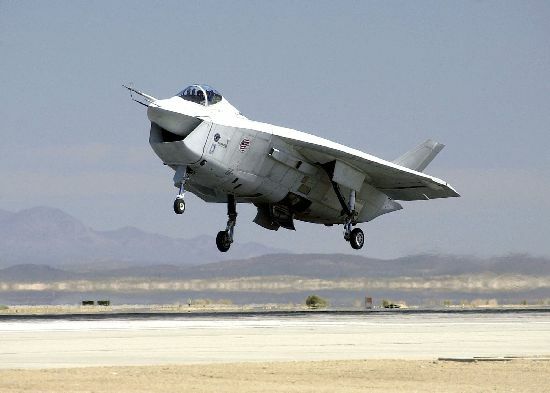 The X-32 concept has a chin inlet and a blended delta wing. In short take-off and vertical landing (STOVL) mode, the engine closes the vectorable cruise nozzle and opens two lift nozzles at the aircraft c.g. Boeing's design for the operational aircraft has an empty weight of about 22,000 lb, length of 45 ft and a wingspan of 30 ft; maximum take-off weight would be about 50,000 lb. 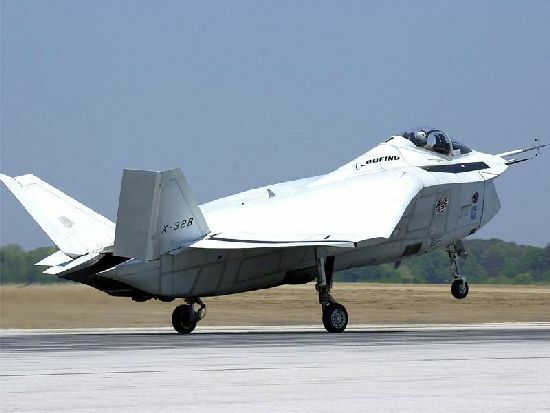 Resources related to the X-32B JSF, provided by the Vertical Flight Society. 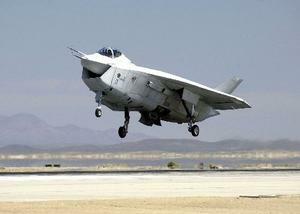 Resources related to the X-32B JSF, provided by public sources across the internet.